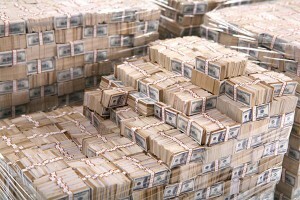 In 2004, the Bush administration flew twenty billion dollars of shrink-wrapped cash into Iraq on pallets. Now the bulk of that money has disappeared. The funds flown into the war zone were made up of surplus from the UN's oil-for-food program, as well as money from sales of Iraqi oil and seized Iraqi assets. Recent estimates had the amount of missing money at about $6.6 billion, but according to Al Jazeera, Iraqi Parliament Speaker Osama al-Nujaifi says the figure is closer to three times that amount. Officials were supposed to distribute the money to Iraqi government ministries and U.S. contractors tasked with the reconstruction of Iraq, but it now appears that the bulk of the cash was stolen in what may be one of the largest heists in history. The Iraqi government argues that U.S. forces were supposed to safeguard the cash under a 2004 agreement, making Washington responsible for the money's disappearance. Pentagon officials claim that given time to track down the records they can account for all of the money, but the U.S. has already audited the money three times and no trace of what happened to it can be found. Oops... it was PureTrust (#10621) 's post that was full of ignorance. Sorry author, carry on. The author's ignorance astounds me. Loans are not a creation of money, and the fact that this is attempted to be passed off as common knowledge is completely ridiculous. Someone needs to study a bit more into how economic systems work. Not to say that there aren't a couple decent points here, but this is nothing more than sensationalism and I SINCERELY hope that no reader takes this without a grain of salt. Don't get too upset about missing Iraqi billions, or about gigantic bailouts and the like. Oh sure. I wish I had a little of it, as well. But here's why to not be too upset. Over the years banks around the world have created "money" out of thin air. They did it by printing currency paper that wasn't backed by value... like gold or silver backed value. Then they loaned the fake money to people and governments knowing full well that the only way the people could pay the interest was to borrow more money to pay it. And so the cycle continued. 3. This was multiplied as they demanded their interest on the loans. Here is where the problems for the banks comes from. Consider that they don't want to lose control. How much money do they have listed on their books - their ledgers - from all this immoral/unethical money making that they have been doing over the years? Is it beyond $trillions? Might it be beyond $QUADRILLIONS? This never happened in the world before, ever. Too many people are, or are, becoming aware of the above. The banking industry can't predict what the best course of action might be since this never happened before. How can they remain in control without collapsing the whole system? Because of this, they are offering bailouts, and allowing money to be "stolen" just to bring down the amounts in their books and ledgers to a manageable figure - amounts that really shouldn't have any value... amounts that only have value because we the people think that they do. Amounts like $billions and $trillions are unimaginable. Amounts like $quadrillions and $quintilians are so far out of sight that it is way beyond impossible to determine what might happen if world situations become too unstable. So the banks are trying to carefully reduce the amounts on their books without becoming too obvious about how the whole system works. Notice how loan money has tightened up over the last few years? This is being done to slow down the creation of new money... since that is what a bank loan really is... the creation of new money. The banking system is essentially dead. But it takes any dead snake at least a little while to stop wiggling entirely.